A little over a month ago, I wrote about mid-20th century British author D.E. Stevenson. Fellow Inkwell compatriot Deb Marvin mentioned a contemporary of Stevenson’s, Elizabeth Goudge, in a comment. Since I’d never read any of Goudge’s works, I immediately typed her name into a search engine. Like Stevenson, she was born around the turn-of-the-(last)-century. And while Stevenson died in 1973, Goudge lived until 1984. An award-winning and bestselling author of romances in her time, Goudge has since become famous for an event that happened years after her death. The late Goudge, you see, was the victim of plagiarism. Copyright infringement happens when a person (or company) misuses a work (art, fiction, photography, music, etc.) that is still under copyright protection. Copyright protections are of limited length, and the duration is established under law and varies from country to country. (Over the last century, the U.S. Congress has increased the length of time a work remains under copyright protection.) After the copyright expires, the work enters public domain and is accessible to anyone. Anyone can make a recording the Messiah without paying royalties to Handel because the score is in the public domain. Here’s an example. Copying passages from Pride and Prejudice and claiming them as your own is plagiarism (stealing another person’s work), but not a copyright violation because the book is now public domain (published too long ago to be under copyright protection). However, copying passages from a Steven King novel and claiming them as your own is both plagiarism and a copyright violation. (It’s also pretty stupid because King is a well-read and well-established author whose words are liable to be recognized by his legions of fans.) The copyright violation is what will probably get you into legal and financial trouble when King’s publisher comes with a lawsuit in hand. This picture has absolutely nothing to do with the article. The author of this blog post snapped the photograph of this creepy visitor to her yard several weeks ago, which means it's an original work and she owns the copyright. If you'd like to reprint this picture, you need to get permission from one C.J. Chase. If she's not feeling generous, you might even have to pay her a small fee for the right to use this photo. That's how copyright law works. Oh, yeah -- and can anyone tell me if the creepy visitor pictured above is a (poisonous) copperhead or a (nonpoisonous) northern water snake? In 1993, Ballantine Books published a novel by Indrani Aikath-Gyaltsen, Crane’s Morning. The book, Aikath-Gyaltsen’s second, garnered enough success and critical reviews, such as this one in The New York Times, that the publisher offered the author a 10-book contract. Alas, it was not an original work. A reader in Ontario and a librarian in New Hampshire both noticed many similarities to Goudge’s novel, The Rosemary Tree. A closer comparison of the two books revealed that Crane’s Morning was nearly word-for-word the same book, albeit with the character and place names changed. Ironically, the original had not received such rave reviews when published in 1956. The New York Times (yes, the same NYT) called its plot “slight” and sentimental. What fascinates me about the two cases isn’t so much the plagiarism itself, but the way people judged the original works and the copies so differently, based solely on the packaging. Because the latter were classified as “literary” works, the critics praised them and the publishers supported them with more money and marketing than anyone had given to the original works. It would seem there is a degree of elitism at work. To give credit where it is due, Washington Post reviewer for Crane’s Morning Paul Kafka kind of/sort of admitted as much. “Maybe Elizabeth Goudge is a writer who hasn’t gotten her due.” Um, ya think? Or could it be the “right” people considered Goudge’s work inferior because she wrote commercial, not literary, fiction—because they read it with patronizing eyes rather than seeing what was really there? Worse, do we treat people the same way, considering them inferior because of some subjective standard we hold dear? Oh, and by the way, while working on this post, I learned that the movie The Secret of Moonacre was based on Goudge’s award-winning children’s novel, The Little White Horse. Novelist J.K. Rowling called The Little White Horse her favorite childhood book. If you’ve never seen the movie, well, let’s just say Ioan Gruffudd back in period garments. this is a super post in so many ways. I love what you dug up! ooh bunny trails and intrigue! Yes, I have never read an Elizabeth Gouge but my mother read a few of the repeatedly. She must have been disappointed in me. I think it was the fact the books were old and worn and I was 'at an age' of doubting! I have to admit this-- I have read published stories where a certain phrase comes up that I have used word-for-word in a work-in-process and thought OH NO! Now I have to change it... so maybe that's a bit over the top? Fascinating though, how you saw this evidence of genre-bashing (literary is good, genre, such as romance is not) okay not so black and white but 'romance writers' are definitely at the bottom of the ladder. I think mystery writers get a lot more respect! I hope that the lawsuit brought a few new readers to Elizabeth Gouge's legacy and I am sure it's time I did the same. Thanks C.J.! Good morning, Deb. I've had those same worries about a phrase, but I've come to realize that I'm probably being too uptight. I think for it to be plagiarism, it has to be egregious enough that people recognize it as intentional. The Viswanthan case isn't as egregious as copying an entire book, but it's more than a phrase here and there. It's sentences and paragraphs that are eerily similar. Oh, there are some changes, but the structure and most of the words are the same. The Wiki page for the Opal Mehta book has examples of *some* of the passages in question. Viswanthan claims she has a photographic memory and that may be be how it happened. True? She did get into Harvard and her parents were both doctors, so I assume she is at the higher end of the intelligence spectrum. However, there's an interesting twist that I didn't mention. Viswanthan was approached by a "book packager" through some connection about writing a YA book with an Indian-American protag. One of the other works she, er, channeled in Opal was written by an Indian-American writer who'd been approached by the same book packager some years earlier about writing a YA with an Indian-American protag. (That woman turned them down.) What does it mean? I don't know if anyone other than Viswanthan knows? The whole "book packager" angle sounds like an entire post some time. Wow, that is crazy. So, perhaps she did have some amazing mental process that unintentionally memorizes mass amounts of text? I can maybe recall one or two sentences and I even STUDY works I admire to learn...no fear here that I'll remember any of it word for word. but suicide? sadly I found myself thinking 'does that prove guilt'? or does it prove the level of despair and being misjudged? Deb, it was ruled suicide, but her (estranged, I think) husband and her writing mentor both suggested it could have been a family member. There was something about her father dying and a dispute about the estate happening at the same time. But it also happened around the time the plagiarism was revealed, so who knows? All around strange. What tangled webs we weave! What sad stories! As to the snake. *cringe* I have no idea. Yukky. CJ, if I had that snake in my yard, I'd probably never go out again. It gives me shivers. Plagiarism is a naughty thing, and I think it might get worse because a lot of the young people I know think everything that's out there - books, music, photos, belong to everyone and are fair game. Too funny that Viswanthan went on to Law School because it looks like she really needed the lessons. As soon as you mentioned hype in the art world I thought of Picasso's works. Thank. You. ! As for the snake, we only have 4 types of venomous snakes in Canada and rarely are their bites fatal. They hang around the dry southern regions of the western provinces and one type around Georgian Bay, Ontario. Mostly, we have regular garter snakes which we've been finding in our old basement (as opposed to our new basement). So when I looked at your photo of the snake, I thought it was pretend because it looked like someone crocheted a cover on a foam tube and was playing a joke on you. Right. Excellent example of copyright, though. Good job! I have to admit I don't get most modern art either. I think it was a bit from "Rebecca" (in the movie, I know, can't remember if it's from the book) where one of the characters says it's something like "a lampshade upside down to represent a soul in torment." Niki, it is sad. There's no evidence Aikath-Gyaltsen's first novel was anything but original. So why plagiarize an entire book? Second book pressure? Suzie, I forgot to mention how often copyright violation happens in the age of the internet. So many pirate sites. Ugh. Anita, it was definitely a real snake. (Notice the word "was.") 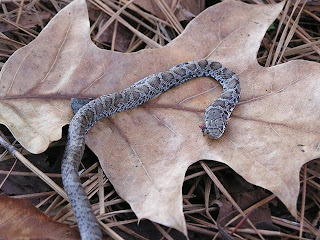 Just a baby -- but both the water snakes and copperheads deliver their babies in autumn (so no help there on identification). can't help you on the snake. sorry. now i want to check out Ms. Goudge's works. I have no clue about the snake. What I do know is I'd screech if I saw it. I am not a reptile person. Could be the venom. Could be the cold, beady eyes. Anyhoo, intriguing post all the way around. I think in this internet age, plagiarism is rampant. Way too easy to copy something online and paste it in, whether you're a kid or adult. DebH, many years ago, we were meeting some friends in DC to go skating on one of the outdoor rinks on the Mall. It turned out to be warm and sunny, so the rink was closed. (I really want a job where you get sent home if it's too warm and sunny.) We went to the Hirshhorn --the Smithsonian's modern art museum -- because it was next to the rink. It wasn't our thing, so we amused ourselves by coming up with names for all the pieces, like "Cat Slammed in Door." Naughty, I know.